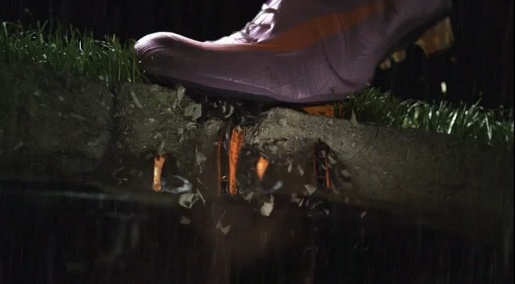 Nike is promoting the Mercurial Vapor Superfyl II, a football boot with SENSE adaptive traction technology studs, with “Rewrite The Rules of Speed”, a commercial featuring FC Barcelona’s Zlatan Ibrahimovic. A mechanical pitch tests Zlatan’s speed to extraordinary extremes. As he glides past oncoming defenders he must also grapple with rapidly changing surfaces and weather conditions. Unfazed by the terrain, Zlatan powers his way past defenders as his boots quickly adapt, grip the ground and accelerate towards victory. When designing the Mercurial Superfly II, Nike created an adaptive stud that extend and retract by up to 3mm, based on ground conditions and pressure exerted by the player. Two of these studs on the forefoot of each boot combine with directionally positioned blades to allow for quick changes of direction, while secondary toe traction provides added power for those first critical steps. The result is a boot that enables greater speed in all directions – in all conditions. The Mercurial campaign was developed at Wieden+Kennedy Amsterdam by creative directors Mark Bernath and Eric Quennoy, art director Pierre Janneau, copywriter Mike Farr, producers Neil Henry and Cat Reynolds, head of broadcast Erik Verheijen, executive creative director Jeff Kling, account team David ANson, Jordi Pont and Gene Willis, working with Nike representatives Enrico Balleri and Colin Leary. Filming was shot by director Edouard Salier via Paranoid US, Paris, by executive producers Claude Letessier and Cathleen O’Conor, head of production Matej Purg, producer Anne Lifshitz, line producer Romain Staropoli, post coordinator Charlotte Raffi, director of photography Wouter Westendorp, with graphic designers Marthe Salier, Xavier Reye, Julien Michel, Damien Martin, editor Olivier Gajan. VFX were produced at Digital District by producer David Danesi, VFX supervisor 3D artist Julien Rancoeur, lead Flame artist Christophe Richard. Sound and music were produced and designed at Massive Music, Amsterdam, by Guy Amatai.